Have you ever Questioned whether the Essential Oils you buy are Pure, Sustainable and Safe? Aromatherapy has never been so popular! We have never had such a wonderfully large selection of oils and vendors to choose from! But how do you know which essential oils and vendors to trust? I understand that buying essential oils can be hard. As a botanist, when I started researching essential oils, I was alarmed by the incredible amounts of errors made in plant naming–some quite dangerous–by famous vendors and renowned sources! 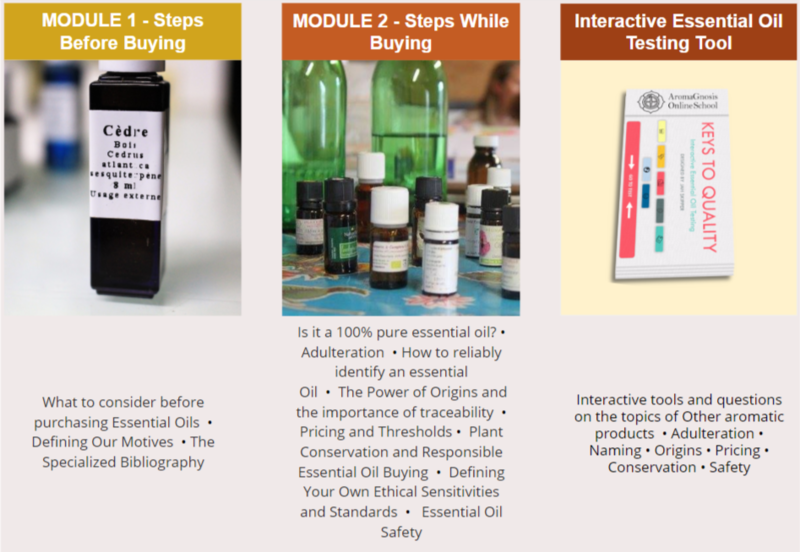 This course is the result of a passion project: My desire to bring clarity to a very confusing and unreliable market – the wild jungle of Essential Oils! Recently, I have become an quality source adviser for Cathyssttars.com. Being professionally involved in buying essential oils has taught me a lot about getting your hands on the best oils! 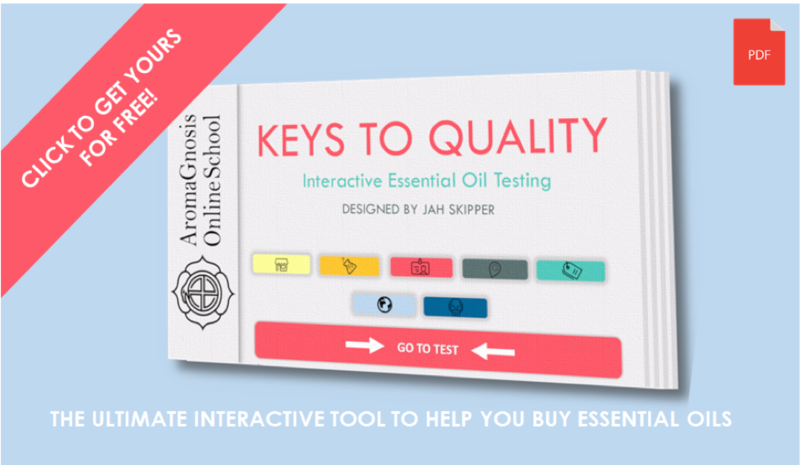 I have distilled my expertise into this course so you too can buy good essential oils reliably! My insider secrets and powerful techniques will make the buying process easy for you. Wouldn’t it be great to have a class that could help find the Best Essential Oils? More and more of us are using essential oils for wellbeing, beauty, perfume, spirituality and many other reasons. For many of us this empowering step towards a more “natural” way of life. BUT: Did you know that a recent study  on Damask rose (Rosa × damascena Herrm.) has shown that ONLY ONE out of the numerous oils they tested from around the world MIGHT BE 100% PURE? I knew adulteration was present but these results really blew my mind! This study suggests that the vast majority of essential oils of rose have been adulterated. Buying a high quality essential oil is actually much more challenging than most of us think! 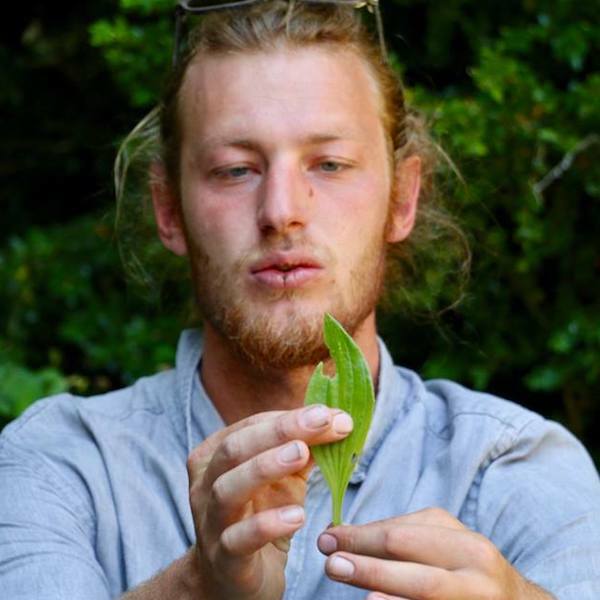 If you don’t have a guide, continually checking the chemistry, botany, sustainability, economics and many other topics, is the only way of to make sure you’re actually getting the right oil for your needs, while being ethical and sustainable. As you have probably already noticed, essential oil quality varies widely. There are barely any regulations and many unethical companies and products. I’ve been frustrated by spending a lot of time searching for new and trustworthy oils. Where should we begin to make sure we are buying good oils? This course is designed to address the main topics that you should look into before going ahead and purchasing that expensive oil you’ve been looking for. Did you know that not everything called essential oil is actually an essential oil? Many people and companies confuse them. There are so-called essential oils for sale from plants which can’t yield an essential oil, for example vanilla! Knowing what products are available for each of the main aromatic plant species is crucial to avoid confusion. In my research for this course, I discovered that out of 175 aromatic plant species only 66% yield an essential oil! 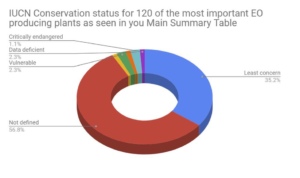 You will have access to my research results for all 175 aromatic plant species, so you’ll always know which aromatic products are available for each species. 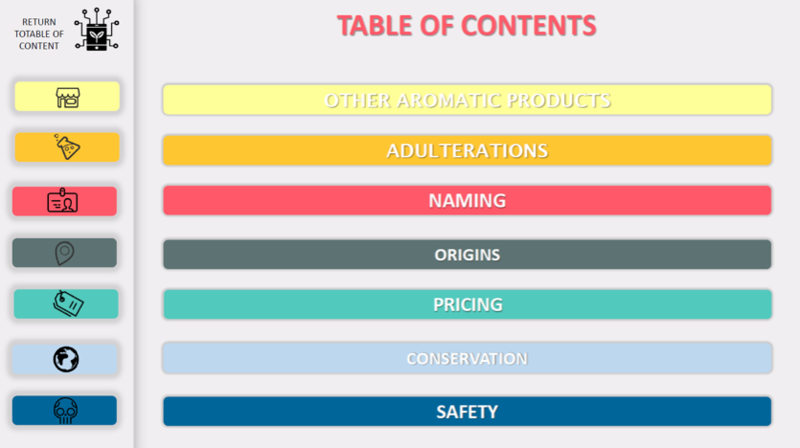 Adulteration is widespread in the essential oil market. Modern techniques of adulteration are designed to pass the most common analytic test and fool many experts! My course will teach you how to make sense of GC/MS and other tests so you can tell if an oil is adulterated yourself! It tells you what other tests you can order to clarify doubts. It empowers you to spot adulterated oils before you buy them. I found out that many essential oils from different species are sold under the same common name! For some of these, one of the oils may require more cautions, due to safety issues–how would you know? Sometimes an essential oil from the same species is sold under diferent names. For example, did you know that essential oil of Cinnamomum camphora is sold as Ho wood, Ravintsara and Camphor? Knowing exactly what essential oil we are buying is crucial to insure we don’t make potentially dangerous mistakes! Did you know that the geographic and production origins of an essential oil can induce such stable and significant chemical difference that we define types around origins? This topic is very important and yet easily overlooked or misunderstood. Even well-known books about aromatherapy don’t discuss this topic in sufficient detail. With my course, you will be able to ask the right questions about origins all the time! We all want to get the best deal when it comes to essential oils. How do you know when you’re paying too much or too little? In addition to the tool, my course contains a reference range for the prices of many essential oils in the US and Europe, so you can know before you buy. 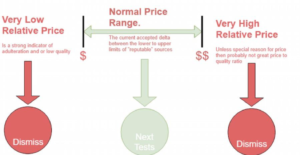 A simple decision tree to see if the price is right. We all want to make sure that our buying choices do not negatively impact endangered plant species! Did you know that we do not know the conservation status of 60% of aromatic plant species? For my class, I researched the conservation status of many well-known essential oil producing plants. Do you know what conservation status actually means? You will learn this, along with how to determine the conservation status using multiple resources. Chart by Jah Skipper: IUCN conservation status for for 120 aromatic plant species ranging from ‘critically endangered’ to ‘least concern’ (categories are explained in detail in my course). Although one could argue that the safety profile of an essential oil has nothing to do with its quality, my course comes with a list of known oils that have safety concerns to empower you. This course is for anyone that intends to buy essential oils. It’s useful both for professional aromatherapists as well as passionate individuals using oils for themselves and their friends and family. After all anyone buying essential oils can greatly benefit from making sure their the best right! Then you will certainly benefit from the online course “A Comprehensive Guide to Buying Essential Oils” which will provide you with everything you need to know about buying essential oils! Ready to Learn How to Source the Best Essential Oils? Follow this roadmap that will lead you to becoming a confident and independent essential oil buyer! No more adulterated low-quality oils! Enroll for the course “A Comprehensive Guide to Buying Essential Oils” now and receive a special welcome gift: A 10% percent off coupon for your next order at Cathy’s Attars. Buy the course now for 89$! 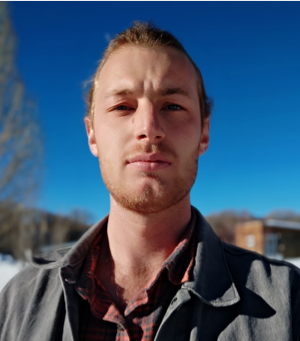 “In a mostly unregulated market, it is up to us, the consumers to become self-reliant enough to discriminate potentially unsafe and lower quality oils.